Derry City striker, Ronan Hale netted his sixth goal of the season in the 2-0 win over Sligo Rovers. 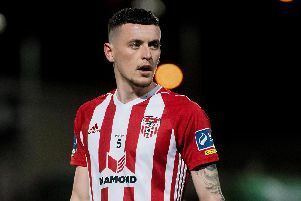 DERRY CITY moved into fifth spot in the SSE Airtricity Premier Division table following a first league win at the Sligo Showgrounds since 2009. It was the Candy Stripes' fifth win on the spin in all competitions as they exacted revenge for the 2-1 loss against the Bit O'Red last February. Rory Patterson netted his third goal of the season when his 17th minute free-kick deflected off the Sligo wall and found its way into the net to give City a deserved lead. And Ronan Hale fired in his sixth goal of the season on 74 minutes as his low shot crept under the body of Micheal Schlingermann. Kenny Shiels made just the one enforced change from the team which eased into the third round of the EA Sports Cup with victory over rivals, Finn Harps. Gavin Peers replaced the injured Darren Cole to make his City debut against the team he won the 2012 League of Ireland title and three FAI Cups with during 11 memorable years at the Showgrounds. The home side made three changes from the team which defeated Galway United in the League Cup with Michael Schlingermann. Greg Moorhouse and Caolan McAleer all returning to the starting XI. The in-form Candy Stripes began on the front foot and almost took a fourth minute lead when Ronan Curtis' glancing header from Aaron McEneff's cross went just wide of the post. Curtis reacted sharply to latch onto Rhys McCabe's misjudged flick-on on 15 minutes but when he eventually got the ball under control his shot was blocked superbly by the outstretched leg of Micheal Schlingermann. Sligo failed to clear the danger and McEneff was brought crashing to ground by a late challenge from McCabe on the edge of the penalty area. Up stepped Patterson and his drilled free-kick took a wicked deflection off the wall which steered the ball into the net as City took a 17th minute lead. The Bit O'Red's first attempt on goal arrived on 37 minutes when Adam Morgan drilled his low strike narrowly wide of the target. And while the home lot warmed into the game Derry were good value for their slender lead at the break. Sligo boss, Gerard Lyttle made a triple change in an attempt to turn it around just short of the hour mark. Brazilian, Eduardo Pinceli, Seamus Sharkey and Rafa Cretaro were all introduced at the expense of top goalscorer, Adam Morgan, Ally Roy and Ramelton man, Kyle McFadden. The changes failed to have the desired effect and it was Derry who came closest to finding the net seven minutes later. Schlingermann produced a neat save as he tipped over from Curtis' powerful left foot strike from the wing on 67 minutes. From the resultant corner, McEneff played it short but Sligo intercepted and broke at pace., however, the promising move came to nothing in the end. Sligo's best chance arrived on 74 minutes when Cretaro chipped the ball towards the near post where Greg Moorhouse nipped in, but his glancing header sailed past the far post. Sixty seconds later Derry doubled their lead as Ronan Hale collected the ball on the edge of the 18 yard box and his low shot crept through the legs of Calum Waters and under the body of Schlingermann. Substitute, David Hopkirk tried his luck from distance but Schlingermann got down well and put the ball behind with three minutes to go. Former Man United man, John Cofie was handed his debut with two minutes left on the clock on the day his ex-teammate, Paul Pogba helped earn the Reds victory over rivals Man City. Aaron McEneff then had a chance to make it five goals in five game at the end but fired his free-kick over the bar which proved the last action of the match. The win moved City into fifth, just one point behind fourth placed Shamrock Rovers with two games in hand. Sligo Rovers: M. Schlingermann; G. Boylan, K. Callan-McFadden (S. Sharkey 59), P. McClean, C. Waters; C. McAleer, R. McCabe, D. Cawley, A. Roy (E. Pinceli 59); G. Moorhouse, A. Morgan (R. Cretaro 59); Subs Not Used - M. Beeney, R. Donelon, A. Wixted, J. Keaney. Derry City: G. Doherty; C. McDermott, E. Toal, G. Peers, J. Doyle; Ronan Hale (J. McDonagh 75), R. Hale, N. Low, R. Curtis (D. Hopkirk 81); A. McEneff; R. Patterson (J. Cofie 87); Subs Not Used - E. Grimes, B. Doherty, S. Whiteside, N. Logue. Referee - Paul McLaughlin (Monaghan).